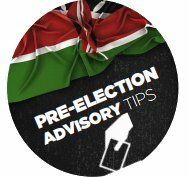 Anytime there are elections in Kenya, it is prudent to plan for the worst and hope for the best. The following are a few precautions you should take. Avoid areas where there are gatherings, protests, and demonstrations. Monitor media and local information sources for up to date information. If you are intending to relocate during the election period, make sure you tell someone where you are going and advise them when you have arrived. It is likely that bus and matatu routes may be disrupted or closed down for the duration. So, if you are planning to go away make sure there is available transport to do so. For car owners, a complete service should be done before Election Day. A full tool kit should be included plus a serviceable spare tyre, a tow rope and emergency kit. Ensure cars are filled with fuel and, if you can store it safely, a jerry can of fuel for emergencies. Make sure you have a fully stocked first aid kit and a sufficient quantity of any prescription drugs. Don’t forget to keep an adequate supply of drinking water. A full gas cylinder and where possible a spare one should be kept handy. Remember also that your domestic staff may need charcoal or kerosene to cook by and it would be helpful for you to have a small stock of food for them too. Ensure domestic alarms systems are tested and serviced. Have a serviceable fire extinguisher at hand. Store dry food stuff (powdered or UHL milk, for instance) as opposed to fresh as electricity supplies may be disrupted and refrigeration may not be available. If you use prepay ‘phones, you should purchase spare scratch cards in advance and invest in solar battery chargers – don’t forget your domestic staff! If you have a generator, ensure it is serviced and fuelled. Family records (marriage, birth certificates etc). Have a basic emergency plan for all employees. Ensure the guard company understands its role in this. Check that critical data is backed up at a remote and secure location. Ensure logistics are set and in place. Identify alternative suppliers for essential goods. Check that all fire fighting equipment is serviceable and readily accessible. Have power back up systems in place. Ensure both business alarms systems are tested and serviced. Also, see Kenya Emergency Contacts.